Ipomoea beach morning glory buds & flower comes from the Greek ιψ (ips), a worm, or rather from its genitive (possessive) form ιπος (ipos), and 'ομοιος (homoios), like; so it means ‘worm-like’, referring to the coiled flower bud. The specific is a pair of Latin words, pes, a foot, and capræ, of a she-goat; brasiliensis means, of course, ‘from Brazil’. This is a pan-tropical trailing vine that routinely colonizes sand dunes. It grows just above the high-tide line along coastal beaches, forming large mats that assist greatly in stabilizing the sand. 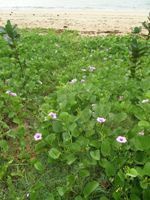 When the Strand in Townsville was being revitalized, many thousands of seedlings of the vine were planted along the foreshore. The runners are succulent, and have a milky-coloured sap. Its branches may reach to 10 m in length. The leaf petioles are less than 2 mm long, and the leaf blades measure anything up to 14 cm in length and 12 cm in width. The leaves are alternate, somewhat elliptic, and have shallow notches at their apices. The taproots are long and deep, sometimes penetrating more than a metre downwards. The flowers are generally axillary, mauve-purple and infundibuliform, about 7 cm in diameter. The colour tends to be deeper at the centre of the flower, with radii of this darker colour reaching to the outside of the flower. The flowers are short-lived, blooming at sunrise, closing by mid-afternoon, and dropping off the plant the following day. Pollinating species include bees, butterflies, moths, beetles, wasps and ants. 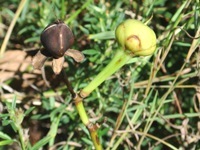 flower pods Fruit production is generally high, but is affected by storms, high tides and plant density. Each fruit produces four brown seeds each almost 1 cm long. The seeds do not require a dormant period before sprouting, but the seed coat is impermeable to water, and must first be abraded by sand before the seeds can germinate. The ability of seedlings to become established depends on the same factors that affect the parent plants: wave action that can easily uproot young seedlings; accreting sands that can bury seedlings in a short time; and they are also subject to space competition and shading by established plants. This plant survives well in beach communities, and remains green even when subjected to salt spray and wave splash. It recovers well from tropical cyclones and storms that sometimes inundate beach areas with sea water. Animals do not graze the foliage because of the latex, and because the leaves produce an alkaloid compound disliked by most insects and grazing animals, although the caterpillars of the Sweet Potato Leaf Worm Aedia leucomelas and the moth Aedia arctipennis do feed on them. The flowers, however, have no such defences, and are routinely eaten by caterpillars, beetles and grasshoppers. 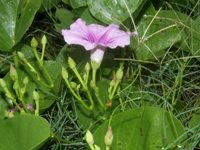 In some parts of the world, Ipomoea pes-caprae is used in traditional medicine to treat fatigue, strain, arthritis and rheumatism, and also as a diuretic. On the Malay Peninsula, the latex is applied to stings from fish; in Indonesia, a poultice of crushed leaves is used to treat boils, and sap from the half-grown leaves boiled with coconut oil is used as a salve for sores and ulcers; and in the Philippines, the boiled leaves are applied to burns.